Historical Marker #518 describes the Civil War in Barbourville in Knox County. At the beginning of the Civil War, Unionists established Camp Andy Johnson near Barbourville. Kentuckians and East Tennesseans were recruited there, and, on September 19, 1861, Confederate General Felix Zollicoffer's troops attacked the camp. The resulting action, which pitted 800 Confederates against 300 Union soldiers, was the first skirmish in Eastern Kentucky. Although the Union troops initially delayed the rebel assault, they were overwhelmed and pushed back. The Unionists lost 12 killed and 2 captured, while the rebels sustained 1 killed and 4 wounded. The Confederates then destroyed the camp. Almost a year later, several Confederate armies invaded Kentucky. In August 1862, one army led by Confederate General Edmund Kirby Smith occupied Barbourville for nearly a week. There, Smith planned his advance into central Kentucky, which led to the Battle of Richmond later that month. Confederate troops captured Federal food and supplies at Barbourville, which aided them as they marched into the bluegrass. Because of its proximity to Cumberland Gap, Barbourville was an important Kentucky community during the Civil War. Cumberland Gap, 1862: Because of its proximity to the Cumberland Gap (pictured here in 1862), Barbourville was an important location during the Civil War. Courtesy of the Kentucky Historical Society. 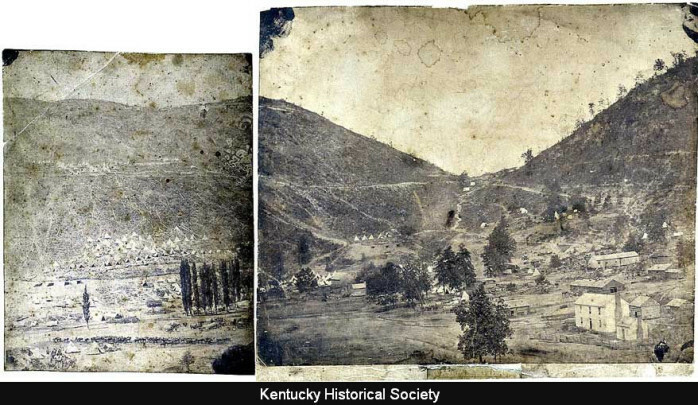 Stuart Sanders, “Barbourville, Kentucky,” ExploreKYHistory, accessed April 22, 2019, https://explorekyhistory.ky.gov/items/show/29.